Looking for a recap of the West Coast tryout? It’s here. WINSTON-SALEM, N.C. — Over a hundred athletes descended on the BB&T Soccer Park this past weekend for a two-day tryout to be evaluated for the United States Under-24 National delegation. Tryouts were ultra-competitive, high level, and grueling, with just 72 spots available between the three teams from an initial applicant pool of over 550. Energy and explosive plays defined the weekend as players battled for a chance to represent the country in Heidelberg, Germany, in July 2019. Clear blue skies and brisk temperatures met players in the opening 9am Saturday huddle, where Tom Manewitz, USA Ultimate’s Manager of College Competition & Athlete Programs, set the tone for the weekend. “This is an opportunity to build strong, meaningful relationships that will last for the rest of your lives,” Manewitz told the eager huddle. As players broke into their respective rotational groups for Saturday’s tryout, the atmosphere was electric from the outset, with the Men’s and Women’s fields side-by-side, while the Mixed rotation moved across the complex due to the previous night’s rain. Each head coach expressed similar sentiments to Manewitz in their opening addresses to the players: appreciate the moment, meet new people, and enjoy this rare opportunity. After dynamics and plyos on the men’s field led by assistant coaches Darryl Stanley and Joe Durst, returning head coach Bob Krier led the tryouts in a soccer-style box drill to encourage working with different people, prioritizing eye contact and using nonverbal cues to complete passes in different ways. Players moved through a 50×50 yard box with multiple discs in play, hugging the outsides of the box and weaving through the middle to complete passes. Though initial rules and constraints were given, the drill was designed to see which players adapted quickly to uncertainty and moved through full speed cuts while improvising. “You are just connecting and combining with different people and there’s a lot of variation on how we challenge players to get out of their comfort zone and think differently,” said Krier. The men’s rotation quickly switched to small-sided games with no pull; instead, the coaches opted to have players start with the disc on the trap sideline. The level and depth of talent was absurd: a team led by Mac Hecht (Brown), Matt Gouchoe-Hanas (UNC), and Brett Gramann (UMass) faced off against another featuring Henry Fisher (Carleton), John Randolph (Brown), and Tannor Johnson (UMass). Tremendous handler reset pressure from Raymond Lu (Michigan) led to a high-stall reset miscue on the goal line and the weekend’s first Callahan. In contrast to the big space play from the Men’s tryout, Women’s head coach Nancy Sun opted first for a small-spaced 1v1 defensive drill. Offensive players cut for a slow ten count stall, while defenders worked to take away the underneath space, pursue to the break side, and re-orbit in a confined space. This drill put the spotlight on 1v1 matchups and allowed for quick assessment of player’s conditioning, balance, and defensive footwork. One thing that stood out from the start was the priority Sun and her staff, Alex Snyder and Jason Adams, put on creating an energy-driven, vocal environment. Cheers, encouragement, and sideline energy were a big emphasis all weekend long. “The ideal culture is one that’s positive, supportive, and balanced. 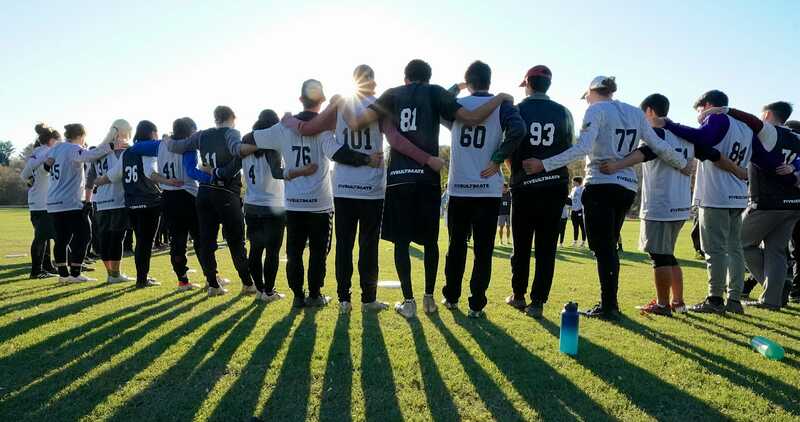 There’s room for people on this team of all different backgrounds, experiences, and ways of expressing themselves, and it’s a priority for us to make sure we have coverage in all those areas,” Sun told Ultiworld after tryouts ended on Sunday. Energy rose to another level on the Women’s field when players had their first opportunity to stretch the field in a 2v2 ho stack cutting drill. Amy Stoddard (Michigan) quickly took advantage and thrived in the big space environment, showcasing precise upwind throws to streaking cutters, including Lindsay McKenna (West Chester) and Caitlyn Lee (Dartmouth). Though the Women’s program can only potentially return five players, it’s a big five. The Dartmouth contingent of Jac Verzuh, Julianna Werffeli, Angela Zhu, and Claire Trop plus west-coast tryout Ella Hansen (Oregon) combined for over 34% of Team USA’s assists in Perth. After an extended break for lunch, Mixed head coach Mike McKenzie and his assistant coaches, Lauren Boyle and Patrick Sherlock, spent time on the whiteboard shaping reset space and progressions, as well as defining end zone priorities and distinguishing between handler and cutter space. Though a fair amount of time was spent on teaching, there was no shortage of 6v6, creating some entertaining matchups and cross-gender hucking opportunities: Anna Thompson (UPenn) wound up for a huge backhand huck to Dillon Lanier (Carleton), Gouchoe-Hanas hit a streaking Annelise Peters (Ohio State), and Joe White (Carleton) pushed deep early and often for pinpoint bombs from Zhu. Stars were on display all over the mixed field, but players still made a clear priority to share the disc and create space for one another. “Everyone respects their teammates and their skills so much that it’s a really selfless atmosphere, despite the fact that all these players are all-stars,” said McKenzie. Player preferences between single gender or mixed can certainly shift between cycles, but the US mixed squad has the potential to return a full third of the 24 person roster from its 2018 gold medal campaign. Day two of the mixed tryout saw more emphasis on cross-gender play, with a power position hucking drill and endzone reps with men and women working together in the reset space. Players were rewarded for their grind over the weekend with full field scrimmages on four parallel fields competing at once: two for mixed and one for each gender. Though energy remained high, fatigue set in and was especially apparent in the reset space. That also made for some mix-ups: a force miscommunication opened up Spencer DeRoos (Cornell) for a huge cross-field flick huck to a wide open Stoddard and a thrower miscommunication led to a perfectly timed, full-extension block on an under from Dawn Culton (UNC rookie). With forty-five minutes to go on Sunday afternoon, the mixed scrimmages ended early to consolidate into two fields of single gender play. Packed sidelines, limited playing time, and all eyeballs on just two fields made this by far the most exciting portion of tryouts. One of the plays of the day on the Men’s field came when Rocco Essex-Linehan (New Hampshire) caught a force side under, surveyed the field, and locked eyes with a streaking Walker Matthews (UNC). Linehan rifled a laser, low-hanging flick to the endzone that at first looked uncatchable but hung for just a split second long enough for Matthews to speedily make the layout for the score. On the women’s field, Renata Pepi (Bard College) caught an under on the flick sideline, spotted a streaking Annie Shriver (Vassar), and didn’t hesitate to uncork a bomb which Shriver had no trouble tracking down, laying out in the back of the end zone for the score. The proliferation of youth programs across the country, access to high level coaching resources, and the explosion of YCCs have all contributed to the remarkable depth of skill and athleticism on display at these tryout. In the Men’s scrimmage on Saturday evening, Connor Russell (UNC-Wilmington) and Joe Freund (Virginia Tech) went at it in the battle of the bigs. Both players weren’t afraid to boost it and their comfort with physicality led to some incredible downfield back and forth plays. Christian Boxley (Georgetown) played consistently all weekend long, but it was in the ‘five throw shot clock’ Men’s scrimmage where his vertical explosiveness truly came through. Georgia Tech’s Jenny Choi played especially well in the women’s 3v3 showcase on Saturday evening, showing off a diverse array of break throws and explosive, possession-saving layouts. North Carolina Warhawks alum and UNC freshman Dawn Culton earned some ridiculous layout blocks on underneath cuts over the course of the weekend. Domenica Sutherland (Texas) sky-rocketed many deep pulls, pinning opposing offenses in their own endzone, forcing them to start in tougher positions. Tryouts gave Division III players a high profile platform to shine on, including Zoe Hecht (Oberlin), Joe Richards (Mary Washington), and Kai DeLorenzo (Middlebury). Chance Cochran (Tulane) was particularly effective in Sunday’s mixed 6v6 scrimmage working with Mac Hecht, and coaches took notice more than once of his endurance and shutdown defensive positioning. Carnegie Mellon’s Jasper Tom may have had the highest and farthest layouts at the tryout. Though he didn’t connect on all of them, his willingness and ability to throw his body around made for some ridiculous highlights. Notably absent was Jac Verzuh who, if selected, will be the only delegation member to be playing in a third cycle. Michael Ing (Pittsburgh) was present but not cleated up due to a foot injury. Due to weather conditions the previous weekend, the North Carolina Fall HS Girls State Championships took place simultaneously on Saturday at the BB&T Soccer Park. Chapel Hill High School took the state title with a 7-5 win over High Country Home Schoolers. Comments on "USA U24 Tryouts 2018: East Coast Recap"